One of the main issues that the Canadian fashion industry has is division. The industry lacks unifying support between all major fashion cities in Canada. All cities must come together and within each city to have unity and support within ourselves. The industry is in need of something that breaks the vicious cycle of division and unites us all. Colorful silhouettes of people. 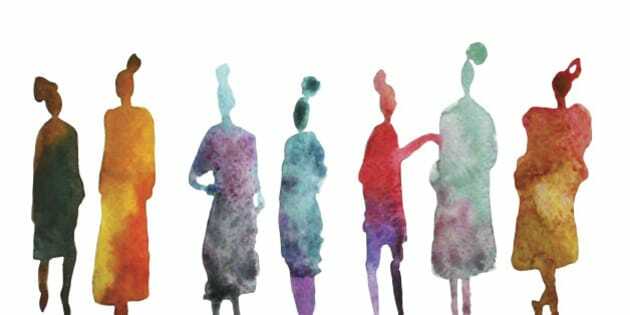 Watercolor background with silhouette of women. Stylish silhouette. Canada at one time or another had many cities building the Canadian fashion industry. In a previous blog by Naira Fragoso da Costa, titled, "Canada Needs A Fashion Council To Save The Industry," we got an introduction into the Canadian fashion industry and why it is not flourishing. One of the main issues that the Canadian fashion industry has is division. The industry lacks unifying support between all major fashion cities in Canada, such as Toronto, Montreal, Vancouver and Ottawa. All cities must come together and within each city to create unity and support within ourselves. The industry is in need of something that breaks the vicious cycle of division and unites us all. Fashion weeks showcasing seasonal collections used to be prominent in many Canadian cities. Slowly there has been a decline over the last few years as fashion weeks in major Canadian cities started to disappear. For those who don't know, IMG pulled the plug on Toronto Fashion Week and made its last Fall/Winter 2016 season back in March. Although Vancouver still produces a fashion week, along with smaller markets in the cities Halifax and Edmonton, time will only tell how much longer they can last with the absence of Toronto. As a fashion business major with experience in the industry in Toronto and New York, I believe Canadian fashion needs support in each city, along with unifying support to align all the cities in Canada that want to produce fashion weeks and generate a long standing, profitable business. The senior-vice president/managing director of IMG Fashion Events & Properties, Catherine Bennett had discussed the end of IMG sponsorship for Toronto fashion week with the Canadian Press back in July. "Partnership and sponsorship plays a really important role in it, and I think in the market in Toronto we just weren't seeing the local support for the industry that we do see in some other markets." In America, as we know, they have a fashion council that unifies all designers. The CFDA (the Council of Fashion Designers of America) is a not- for-profit organization that develops emerging designers and supports established designers. The CFDA fashion awards recognize and acknowledge works of excellence within America and the designers apart of the CFDA. There is also a scholarship program in place to award students with merit-based scholarships, who apply to a four-year college program in fashion. Not to mention the countless amount of grants awarded to designers apart of the CFDA. If a council was to be introduced in Canada, I believe it would benefit the industry immensely. The CFDA is a partnership between all designers across America and a sponsorship as well to powerhouse New York's fashion weeks. Having a council in Canada would unify the industry and sponsor fashion weeks for years to come. If a council was present to govern all things related to fashion weeks and designers, it would bring about local support, country-wide support and generate funding. It would connect all aspects of the Canadian industry from designers to manufacturing to other creatives. Fashion is art and commerce with an estimated $887million dollar economic impact in just New York City alone. Imagine the benefits of a council that would govern the industry in Toronto, Vancouver, Montreal and Ottawa? The possibilities would be endless. Of course, this cannot happen overnight, it will take a lot of time and years to build a council. But we must start now with local support within each city and an overall positive supportive force between Canada. Coming together will not only benefit us in the long run but eventually show the other fashion cities that Canada too can compete with the rest of the world. All in all, if we don't support each other now, no one else will!